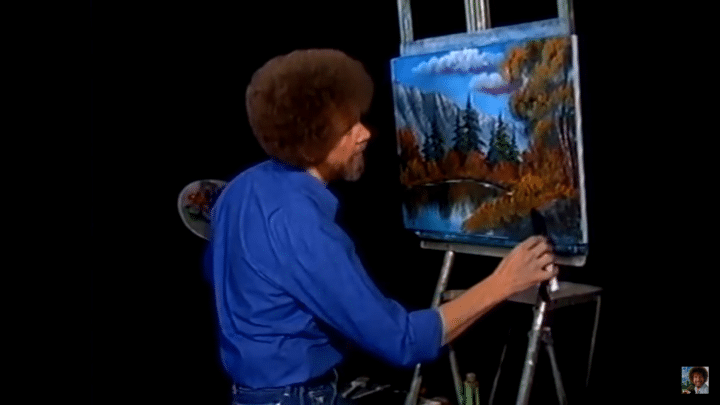 I have been a longtime fan of the soft-spoken nature painter known as Bob Ross. With his two series collections on Netflix, “The Joy of Painting” and “Chill with Bob Ross,” I have been wanting to try and attempt my own Ross painting. After watching many episodes, I did not think it would be too difficult to try and paint along with him. I was so wrong. I brought up the “Autumn Woods” episode from Season 10. 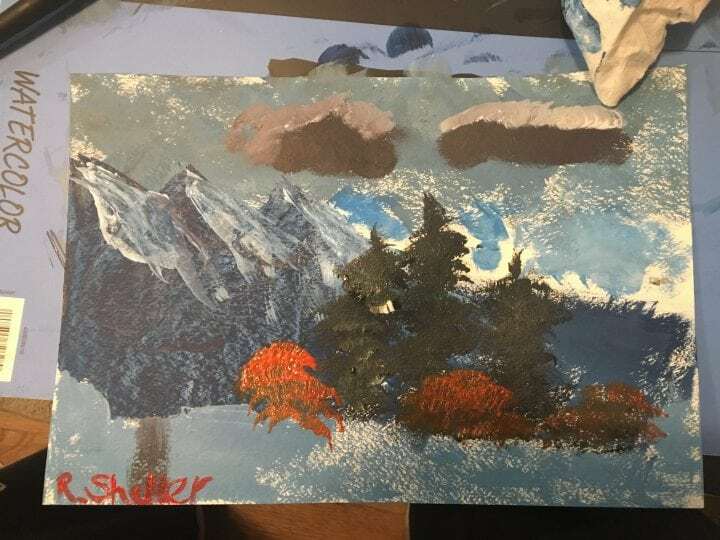 It would be a “nice little painting” with beautiful snow-capped mountains and a pretty lake underneath a beautiful blue sky. Before I started, I set up my colors that would be needed for this painting. Lizard crimson, pthalo blue, van dyke brown, titanium white; I was ready for battle. I did not pause or halt the video at any time. I thought that to get the full experience, I would truly paint along with the program. That might have been the cause for my downfall. At first, I was content painting my blue sky even though it didn’t look as blue as his. By the time I was done with my sky, he was already on his second cloud. His SECOND cloud. Playing catch-up, I mixed the colors together—with what I thought were the correct combinations—to paint my clouds. I ended up being slightly off with my color schemes. I was not off to a hot start. I was already in pain when, in reality, it had only just begun. He reached for his paint knife which only meant one thing. We were about to paint mountains. Big ones too. He takes his knife and effortlessly carves out a silhouette of a mountain that we would fill in later. I did exactly as he did. I do not know what mine looks like, but it does not look like a mountain. To add insult to injury, we had to take the paint knife and add snow on top. Snow. “With absolutely no pressure,” I grazed my paint knife across my mountains. No pressure? How about no talent!? My mountains looked worse off than they were before. I learned a valuable lesson today. Never take painting as an easy task. Especially when you, a generous three on skill level, are painting with a 10. If you at home would like to attempt an official Bob Ross painting, be warned. This is not for the faint of heart. Below I have an image of what my photo was supposed to look like and how it turned out. I can take criticism well in most of my endeavors, but not a sensitive subject like this. Please be kind.